Waisai is the capital of Raja Ampat regency. 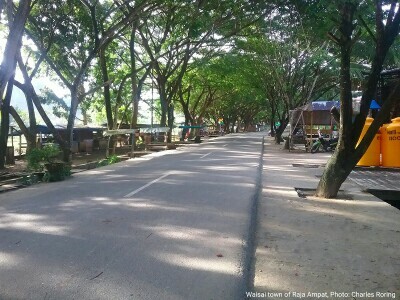 It is a small coastal town in Waigeo island. The population of Waisai is approximately 9,000 people. However, this number is increasing rapidly due to fast development of tourism industry in the region. It is also the center of administration of local government of Raja Ampat headed by a regent. Permits for opening and running dive resorts or liveaboard dive boats have to be obtained from this local authority. Raja Ampat is a regency under West Papua province of Indonesia. Waisai is the transit point to other islands for domestic and international visitors who want to enjoy their holiday in Raja Ampat. 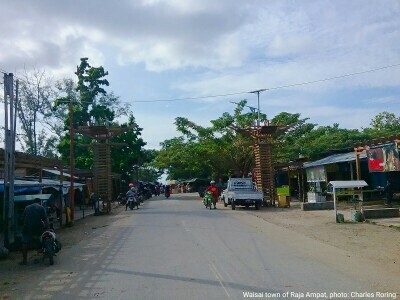 There is an airport in Waisai that connects the town with Sorong city. Regular flights are served by Susi Air. Most international and domestic visitors will fly to Sorong city first before going to Waisai by ferry boat or by plane. Sometimes they don't go to Waisai anymore. Speed boats from dive and tour operators pick them up at Usaha Mina harbor and directly transfer them to liveaboards dive boats or beach resorts in remote islands of Raja Ampat. For beach resorts and homestays that are located in Waigeo, Gam, Kri and Mansuar islands, Waisai town plays very important roles in providing logistical supply to them. Food materials and fuel are bought in Waisai town. Visitors are often picked up at port of Waisai and transferred by car, and boats to the resorts. There is traditional market, shops, and food stalls operated by the town dwellers of Raja Ampat. Banks and hospital can also be found here.